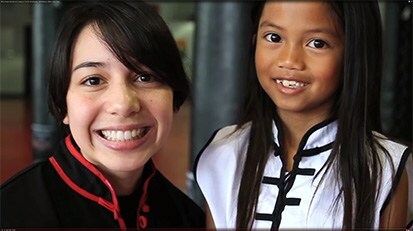 White Dragon Martial Arts is one of the oldest and largest traditional martial arts organizations in Southern California. For more than three decades, we’ve been helping people of all ages improve their lives through our unique combination of Kung-Fu, Tai Chi, Kickboxing and MMA. We are passionate about helping students master the whole self by instilling the core values handed down from teacher to student for generations. Let us guide you on your journey from beginner to master. White Dragon teaches a powerful style of Chinese Kung-Fu called Choy Li Fut, a self-defense system unparalleled in it’s versatility and completeness. Combining striking, joint-locking and close-in fighting techniques with agile footwork, leg sweeps and kicks, Choy Li Fut is one of the world’s most effective systems of self-defense. Famous for its graceful and gently flowing movements, Tai Chi emphasizes calming the mind and releasing mental and physical tension. A few minutes a day spent practicing Tai Chi can help prevent stress-induced illnesses like high blood pressure, digestive problems, and heart disease. Through regular practice, Tai Chi also improves balance, flexibility, coordination and leg strength. White Dragon's Kickboxing Classes are the ideal way to build your fitness level while learning some of the same techniques used by professional kickboxers. Because the training combines a wide variety of techniques, it’s a full body workout that strengthens the core, burns calories, and improves muscle tone. Our kickboxing classes will not only dramatically improve your physical fitness but also provide a fun, high-energy workout that safely sharpens your reflexes. White Dragon's Mixed Martial Arts Program (MMA) is the perfect place to safely hone your skills in the stand-up, clinch, and ground games. Here students learn the same techniques used by professional mixed martial arts fighters in a live, safe, interactive environment. Our combination of Chinese Kickboxing (San Da) and no-gi submission grappling creates a balanced, well-rounded approach to the combative arts. White Dragon instructors have been specially trained to play the role of an opponent by using padded safety equipment that enables students to practice self-defense techniques with full force without the risk of injury. This method enables us to train students to use realistic force to defend themselves in almost any attack situation. It is quite simply the best way to learn self-defense.